At Miraj Hammam Spa by Caudalie Paris, a marriage of Moroccan and French influences creates a unique and lovely spa environment in Toronto’s downtown core. The internationally–inspired spa is the perfect fit for one of the city’s newest luxury hotels – the 202-room Shangri-La Toronto. This multi-cultural city finally has a luxury spa with a cultural feel – created by the fusion of the Middle Eastern hammam and French vinotherapy. And, the matchmaker credit goes to Surinder Bains. Step off the elevator on the fifth floor of the hotel and a Moroccan-inspired water feature creates a sense of arrival. You have been transported to another place and, for the next few hours, you can allow yourself to feel a sense of escape. First of all, guests are invited to be seated on a Moroccan-style settee to check in. Nice touch. Off to one side, the reception lounge offers a comfortable spot to fill out the required health forms, while an attendant invites you to swap your street shoes for the provided spa sandals. The decor is Moroccan inspired: dark woods, richly-coloured fabrics and Moroccan leather – even the pedicure chairs. “Because Toronto is such a multi-cultural city, it needs a culturally-inspired spa,” says spa creator Surinder Bains. We agree. And, what a beautiful, culturally-inspired spa Surinder and Caudalie have created. 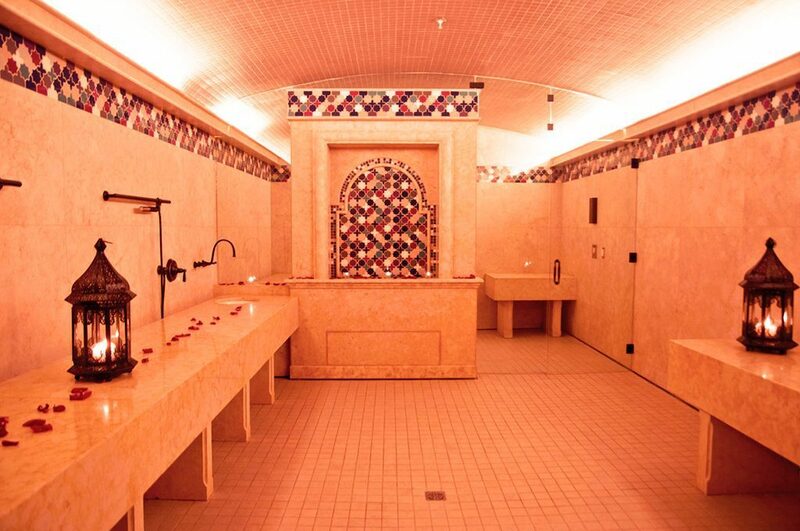 The two hammams are the signature feature of the spa, and they are large and luxurious: Jerusalem marble in swirls of gold and caramel cover the walls and seating areas, limestone carpets the floor, and colourful Moroccan tiles frame water features. They are much more luxurious than what you would experience in a typical Moroccan neighbourhood hammam. Here at the Miraj Hammam Spa by Caudalie Paris, each hammam is booked as a private treatment room – for solos, couples or up to five people. Each hammam treatment – ranging from 30 to 90 minutes – begins with “the steam” while sitting or lying on marble seating. A therapist then scrubs the body with the traditional black Moroccan soap (made with eucalyptus and olive extracts) using gomage gloves (rough mitts used for exfoliation) – working her way up the body from feet to shoulders, neck and ears. A hand shower is used to rinse off the lather. The 30-minute hammam treatment can be booked on its own or prior to a massage, facial or even a manicure or pedicure. The experience is particularly beneficial booked prior to a massage to increase relaxation, or before a facial because the steam helps with the opening and cleansing of the pores. The skin care line is, of course, Caudalie, the vinotherapy-based line from France, and there are a number of facials to choose from. Caudalie products – lotion, shampoo and conditioner – are also set out in the locker rooms for guest use. Along with the made in France Caudalie line, other French touches include the double hot tub encased in a wine barrel in the couples’ suite, the wooden sculptures imported from France, the wine corks hanging on treatment room door handles indicating the room is in use, and sprigs of grapes as a garnish for an après spa snack in the Alhambra Lounge (named for an Islamic-influenced city in Spain). The lounge (pictured above) is where guests, following their treatments, relax in semi-private, Moroccan divans framed with carved wood. Very comfy. Attendants serve guests Moroccan mint tea and baklava presented on brass platters. Overall, Miraj Hammam Spa by Caudalie is a cultural fusion that allows for a unique spa escape in the middle of a busy city.